January 21, 1967 – Kurihama, Japan ?? Matsuda – Inoki RETAINED NWA WORLD TAG TEAM TITLE. 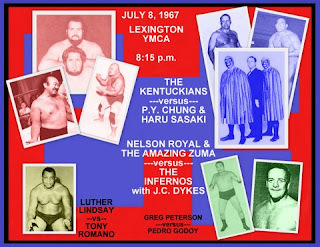 Professional wrestling returns to the LEXINGTON YMCA tonight following a one-week layoff, and two gigantic tag team matches headline the program, starting at 8:15 p.m. The big guys of the sport, TINY ANDERSON and BIG BOY BROWN, known as THE KENTUCKIANS, square off against the crafty and sneaky Oriental duo of HARU SASAKI and P.Y. CHUNG in tonight’s top match. THE KENTUCKIANS have a massive size advantage, but their opponents from the Far East are experts in ju-jitsu and karate, in addition to having many tricks up their sleeves, so anything could happen. The other tag team affair will pit the crowd-pleasing combo of NELSON ROYAL and THE AMAZING ZUMA against the masked terror team of THE INFERNOS, who will have their manager J.C. DYKES in their corner. All four wrestlers are gifted with great speed and ring smarts, but the addition of DYKES, who some fans believe bears a resemblance to Woody Woodpecker, could get involved and make a difference. Both tag bouts are set for the best-of-three-falls. LUTHER LINDSAY returns after an absence and will test tough TONY ROMANO in one of the night’s singles matches. The card opener sends popular GREG PETERSON against veteran PEDRO GODOY. Bill Watts won an 11 Man Battle Royal.